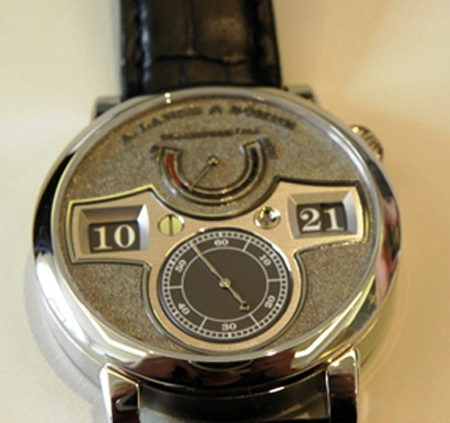 Platinum Audemars Piguet Jules Audemars Minute Repeater with Jumping Hour and Small Seconds ($327,600). We get so used to looking at time on our watch in the typical way — with hour hands, minute hands and seconds – that sometimes we forget there are other options out there. One of our favorite “different” timepieces is the jump hour watch. We love this because of the super elegant and intriguingly different look of the dial – not to mention the genius of watchmaking that goes into bringing one to fruition. Jump hour watches derive their name from their design—in which the hour indication is in a digit format displayed via an aperture (most often at 12:00). Every hour the digit readout changes automatically – offering a visually exciting “event” that is great to watch. The jump hour is definitely an eye catcher. 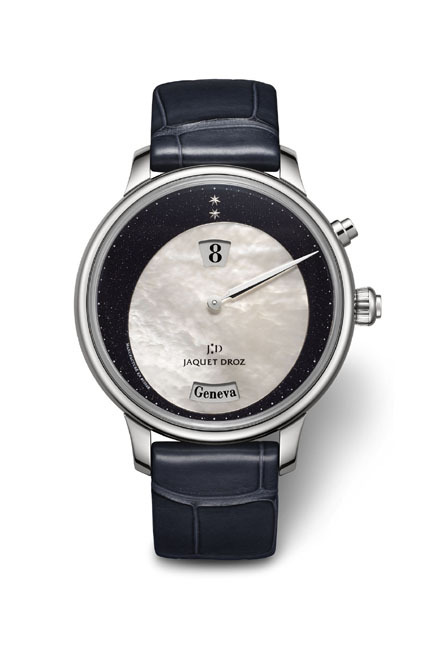 Jaquet Droz Twelve Cities Jump Hour ($31,200) created in a limited edition of 88 pieces. 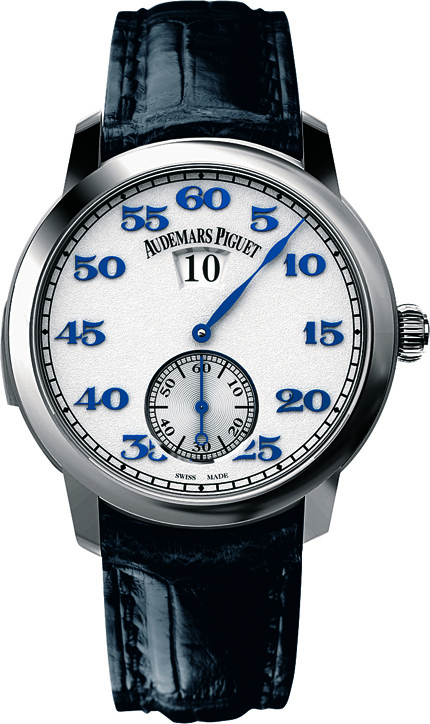 Self-winding mechanical movement with 12 time zones indicated by city names on the enamel dial. Generally, the jump hour indication works via a complex rotating disk system within a complicated movement usually consisting of several hundred components. A difficult feat to build, jump hours usually take added time to assemble — with some requiring several days worth of a watchmaker’s attention. Because of craftsmanship involved and the time-consuming nature of these watches, only about a dozen or so top watchmaking brands create them as part of their regular collections. ist for it everywhere in the world. Interestingly, today’s jump hour watches are based on a concept that was developed and patented in 1882 by Austrian engineer Josef Pallweber, who created a digital display for pocket watches that used numbers on rotating disks in addition to classic pointers. It became a popular complication for pocket watches throughout the late 19th and the early 20th centuries, and interest in them has sparked over the past few years. We’re glad it did. These beauties are wonderful to watch at the change of every hour — reminding us of the things men and machines can accomplish. I just purchased a Christopher Ward jump hour watch. As I understand it, Johann Jahnke, who works with CW, designed their watch as a modification of the ETA 2824-2 movement. It’s definitely a unique and well crafted timepiece. I really am happy with it and the price was reasonable. Christopher Ward timepieces are a great choice!! !